Goalkeeper Gerard Doherty will take over the captaincy at Derry City. 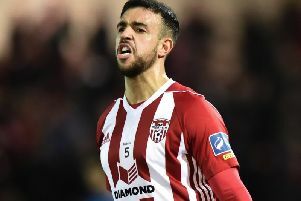 Derry City goalkeeper Gerard Doherty admitted he doesn’t know how to feel about taking over the captain’s armband following the tragic death of former skipper, Ryan McBride. The big centre-back passed away earlier this month, leaving a huge void to fill at the club with Doherty, who served as McBride’s vice-captain, stepping into the role somewhat reluctantly. “It was just a natural progression, as I was vice-captain anyway,” explained Doherty. “Kenny (Shiels) told someone and then it was out and, listen, it isn’t something I want to make a big deal about, it’s just something that’s happened for a crazy, terrible reason but it’s something I’m going to embrace. The 35-year-old keeper, who has been with his home town club since 2008, knows Friday night’s game against Bray Wanderers - the first since McBride’s death - will be an emotional night for everyone at the club. “Yes, at the back of the boys’ mind we’ll want to do it for Ryan, but then we have to treat each game just like any other. We have to try our best and try to treat it as another game,” he added. “First and foremost, if every player has the attitude that they just go out and perform for themselves, then everything else will just fall into place. “All the stuff about Ryan will definitely be in the back of our minds but that’s where we have to keep it for game time. We can’t let it affect us during game-time. Ryan was a big person, not just on the pitch, but around the place too. Doherty knows that their away game at Cork City in a few weeks time, will be another big hurdle for the Candystripes squad to overcome. “Ryan was a big person, not just on the pitch, but around the place too. Before games things will be different. Travelling to away games, he sat behind me on the bus and that will be different,” reflected Doherty. “But everything is going to be different now, it’s just how we deal with it. To be fair to everybody at the club I think they have handled things really well the last week or so and hopefully we can take that into the match now and get a bit of momentum. The former TNS net-minder admitted there will be no big ‘song and dance’ about getting the captain’s armband but he conceded not giving it back to his late team-mate is something which is sticking in his mind. This week the City players have returned to training and Doherty describes the sessions as ‘competitive’, something which McBride would have approved off. “The boys have been absolutely brilliant. Training has had a serious edge to it the last couple of days; nothing too over the top, but boys are really up for it,” he said. Doherty says he, with quite a few other senior players, have been vocal in the dressing room in the past and that will continue. “I have approached more or less every game with the same attitude in terms of responsibility,” said the Creggan man. “You have the responsibility of being a goalkeeper but being the captain as well, you need to see things as the game is going on. Being a goalkeeper I can see a lot more than other players and maybe I can get a bit more information over to people during the game and at half-time.